Like many people in their place of work these days, the professional golfers at Castle Stuart for the Scottish Open are being asked to put in more hours for less money than they earned the previous year. Last July, Luke Donald collected £500,000 for completing 54 holes of golf, with the tournament reduced to three rounds because of poor weather. At this year's event, with Aberdeen Asset Management replacing Barclays as the sponsor, and with the Scottish Government's financial backing, the winner will receive £416,660 from a total prize fund of £2.5m. The total pot for prize money last year at the Inverness course was £3m. The tournament moved to the Castle Stuart links course from the Loch Lomond "resort" course two years ago to attract the top names prior to the Open. The reduction in the players' pot does not seem to have lessened the appeal of the event to world number one Donald and scores of his fellow pros, including Martin Kaymer, Phil Mickelson, Jose Maria Olazabal and Louis Oosthuizen. The appearance of, say, Rory McIlroy, Lee Westwood, Justin Rose or Graeme McDowell would have been a boost but, in truth, these players at the top of the world rankings are experienced links players. With the switch to Scotland's north-east, the drop in prize money and last year's monsoon-like conditions, organisers on the European PGA Tour could really do with a successful four days here. They need decent weather, good crowds and some stirring golf to relay around the world. What would they give to have had some of the other stars from the United States join Mickelson - a Bubba Watson or Matt Kuchar, for example? In any case, tournament director Mike Stewart must be satisfied after day one. Francesco Molinari hammered home in 62, a score of 10 under par, while Alejandro Canizares carded nine birdies and one bogey in his 64. Andrew Johnston celebrated a hole-in-one at the short 11th with 168 bottles of Champagne, one for each yard to the pin. The attendance under grey but only vaguely threatening skies was about 500 down on day one the year before, at approximately 11,300. Much of the country has been experiencing heavy rainfall in recent weeks and, with the economy still struggling, that figure still looks healthy. For those who did pay to get in, the attraction of watching some of the world's best golfers has to compete with the stunning views across the Moray Firth to the Kessock Bridge to the west and Fort George to the east. And the topography of the course itself is so varied that it oozes dramatic appeal. That Castle Stuart, designed by Mark Parsinen and Gil Hanse, opened as recently as 2009 takes some believing. It has the feel of a far, far older venue; the rough looks especially well established. Parsinen, now a managing partner, and general manager Stuart McColm say their goal for the course "has always been that it should not be difficult for the sake of being difficult, but rather it should be interesting and engaging". And therein lies the challenge for the organisers - should they offer the stiffest of links tests before the Open each year, or should this event serve as a low-scoring confidence builder? Forty players in the 156-strong field finished four under or better while only 34 ended the round over par. After his five under on the opening day, world number 14 Kaymer said: "I think it plays fairly easy at the moment. "It's a very wide golf course and you will hit a lot of fairways. "It's just that you have to get the ball close to the flag and that is a little tricky, especially with the pins that are on the corners and surrounded by some ridges. "If you stay patient, there are a lot of great chances out there." South Africa's Ernie Els enjoyed sinking seven birdies but he and the viewers will remember his round of 70 for his four attempts to extricate himself from a hazard on the par-five sixth hole. "I was doing some bunker practice for the Open," he joked. "I was slightly embarrassed there. "The first lie was really horrendous. It was lying down and I was just trying to hit it out to the left and the sand was heavy and I didn't hit it hard enough. "Then it was just a case of digging a grave there." Another to give his opinion on the course was Mickelson, who said he was keen to shoot a low score on Friday to secure his weekend participation. 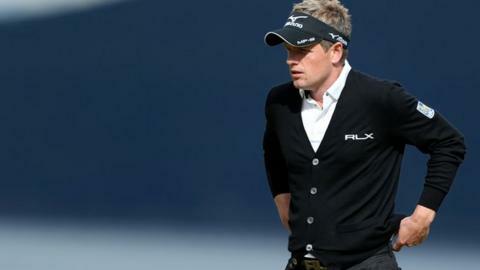 "I think this is a great course to play links golf and get ready for the Open. "It's a wonderful test and it's a fun course to play." Molinari has set the standard. It will be fascinating to see how the chasing pack and Castle Stuart cope with the challenge.